INTERACTIVE FLYING AT ITS BEST! Due to the fact that traditional tandem gliding is so subject to constant weather variations, we offer instructional powered hang gliding. Our brand new Australian built Airborne trike is one of the most reliable, stable, quiet and fun ultra light aircraft in the world. This aircraft features tandem seating in which the student is in the rear and instructor in the front; similar to riding a motorcycle in the sky! 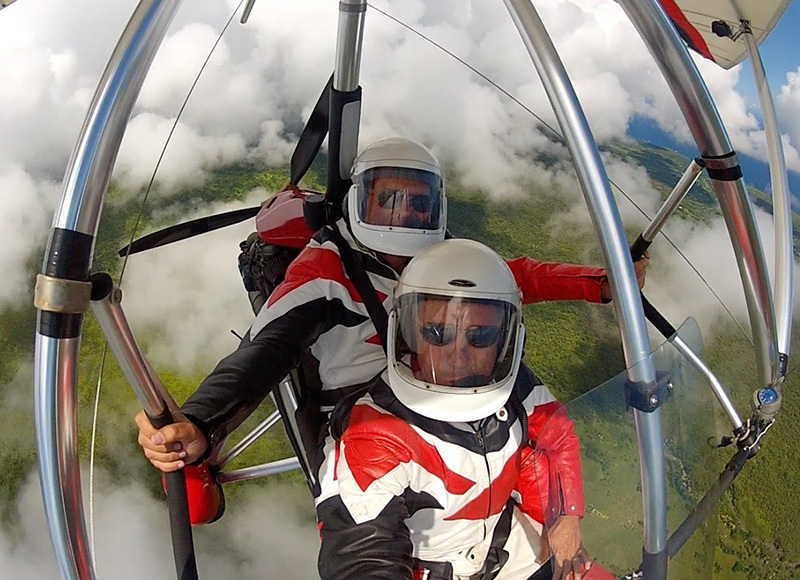 The two place glider offers dual control from either front or rear seats and has a backup ballistic parachute system; a level of additional safety enjoyed by relatively few aircraft. Experience a Maui like no other! Your instructional flight includes a two way intercom system (headsets) enabling easy communication between student and instructor. Helmets are provided and flight suits are also available. During your flight you will learn the basics of weight-shift control, aerodynamics and aviation safety as well as a bit about weather and its affects on aviation. A wing mounted camera is aboard to record your experience for a nominal fee. See views you won’t get anywhere else! Step 1: Take an introductory flight. – The general overview of aircraft. – Clothing for flight/safety equipment. – Demonstrate proper airport and taxi procedures, radio calls, and takeoff. – Student acclimation to sensation of open-cockpit flight. – Demonstrate straight and level flight, turning, climbs and descents. – Allow student to practice roll and pitch control. – Demonstrate proper approach and landing technique. Step 2: Sign up for continuous lessons. Make sure you will have enough time for ground school and flying lessons. There is a 15 hours minimum requirement for flight lessons. The introductory flight will count toward these hours. I recommend you do your 15 hours of flight training within a month. All those hours must be logged. The first 1-5 hours you will get used to the controls. Roll, Pitch and Altitude Management. The rest of your lessons you will learn how to recover from stalls, Ground reference maneuvers, Cross country flights, Take off and Landings. Flying lesson with our Aircraft is $ 250.00 per hour. Flying lesson with your own Aircraft is $ 125.00 per hour. You will learn about: Aerodynamics, Preflight and Ground Operations, Flight Maneuvers, Airspace, Rules and Regulations, Weather etc. This is the Weight-Shift Control Aircraft Flying Handbook FAA-H-8083-5. You can study a lot of this yourself. Ground school charge $ 75.00 per hour. I recommend you start studying from day one. Step 4: Pass your written Exam at a FAA Facility. Step 5: Make an appointment with a FAA Examiner and pass your oral and practical exam. One of the few places where getting there is most of the fun, the road to Hana is often reffered to being the “real Hawaii”. This winding road traverses through some of the most scenic and easiest accessible coastline in Hawaii. 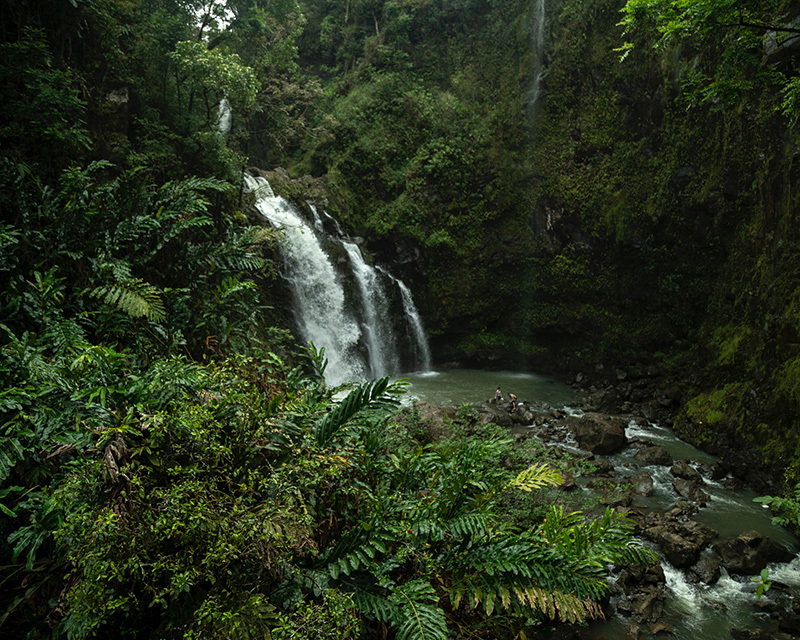 Boasting some 600 curves and 54 bridges, the road features countless waterfalls, tropical rainforest and taro fields that demand your attention! Due to the many photo opportunities you will want to give yourself at least an hour additional travel time to make a few stops. There are also roadside fruit and snack stands featuring local treats such as the Half Way Stop where owner Neta Chong sells her famous home-made banana bread. Between mile marker 28 & 29, Carl & Linda sell fish kebabs and steamed breadfruit from their roadside stand, excellent for lunch! Driving time from Kahului (Maui’s main airport) to Hana is 1 hour and 45 minutes. The road to Hana is breathtakingly beautiful. 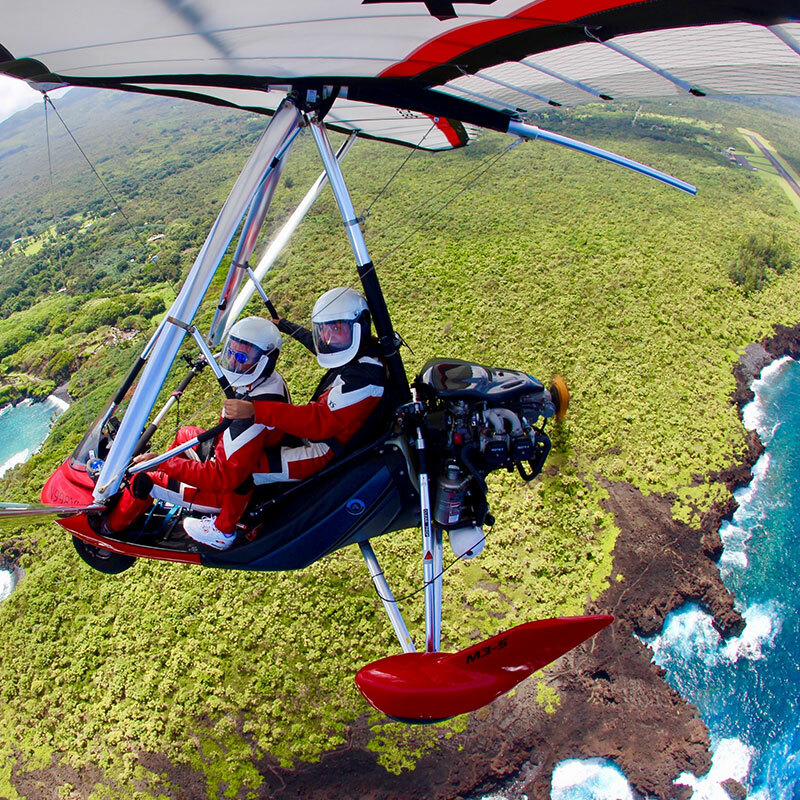 Hang Gliding Maui has a 24 hour cancellation policy. When you book your hang gliding flight, we reserve your scheduled flying time in advance. If you are unable to make your reservation, you must let us know 24 hours in advance. Cancelations made less than 24 hours in advance will be charged 50% of your flight's cost. Thank you for understanding.